What Day Of The Week Is November 27? 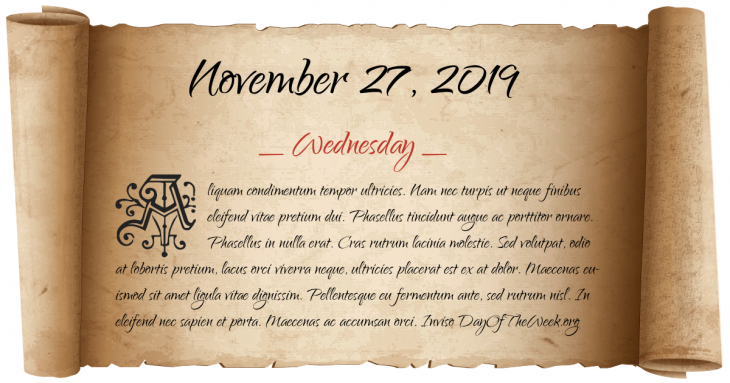 November 27, 2019 is the 331st day of the year 2019 in the Gregorian calendar. There are 34 days remaining until the end of the year. The day of the week is Wednesday. Emperor Marcus Aurelius grants his son Commodus the rank of Imperator and makes him Supreme Commander of the Roman legions. The first elected representatives from Lancashire are called to Westminster by King Edward I to attend what later became known as “The Model Parliament”. The Coup of 1856 leads to Luxembourg’s unilateral adoption of a new, reactionary constitution. World War II: At the Battle of Cape Spartivento, the Royal Navy engages the Regia Marina in the Mediterranean Sea. World War II: At Toulon, the French navy scuttles its ships and submarines to keep them out of Nazi hands. A bomb explodes on the Nevsky Express train between Moscow and Saint Petersburg, derailing it and causing 28 deaths and 96 injuries. Who were born on November 27?